Here is an odd waxy cap, characterized by its glutinous cap and stem and its grayish brown colors. It is closely related to Gliophorus psittacinus, the well known green-then-yellow "parrot mushroom," with which it shares the slimy surfaces and overall stature. 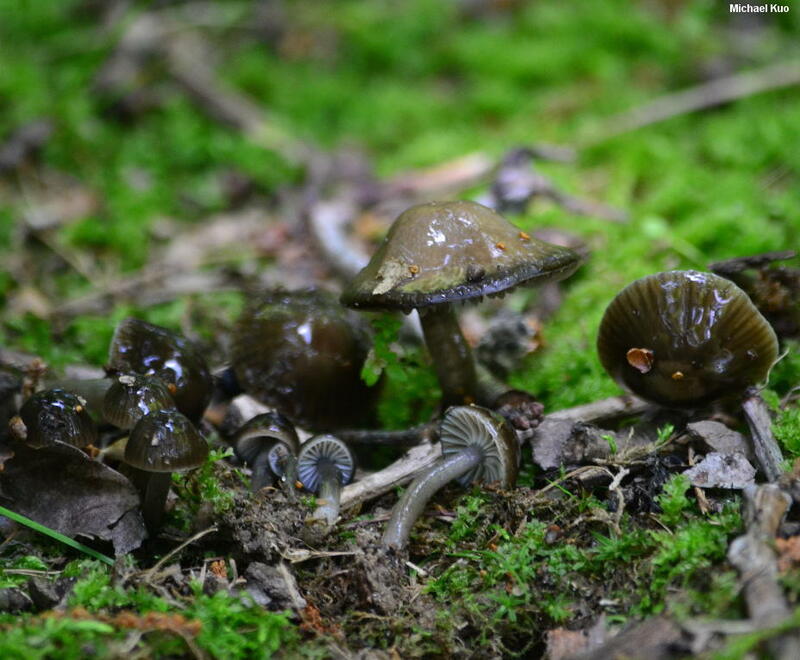 But Gliophorus irrigatus is, well, drab--so drab that it is easily overlooked on the forest floor. It is apparently widely distributed in North America, but not commonly collected. 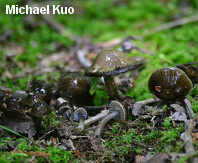 Hygrophorus irrigatus, Hygrophorus unguinosusus, Hygrocybe irrigata, and Hygrocybe unguinosa are synonyms. Ecology: Precise ecological role uncertain (see Lodge and collaborators, 2013); growing scattered to gregariously under hardwoods or conifers; early summer through fall (or over winter in warmer climates); apparently widely distributed in North America. The illustrated and described collections are from Illinois and Québec. Cap: 1-4 cm across; convex at first, expanding to broadly convex, with or without a broad central bump; bald; slimy; nearly black when very young, maturing to dark grayish brown; the margin becoming translucently lined. 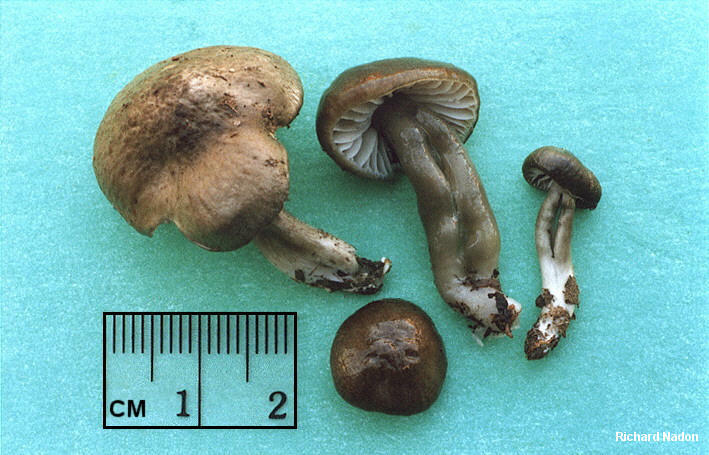 Gills: Broadly attached to the stem, or with a broad tooth that begins to run down the stem; distant; nearly whitish when young, but soon pale gray; short-gills frequent. 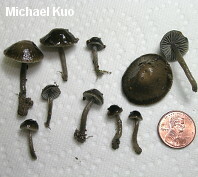 Stem: 2-4 cm long; 1-3 mm thick; equal; bald; slimy; colored like the cap, or paler. 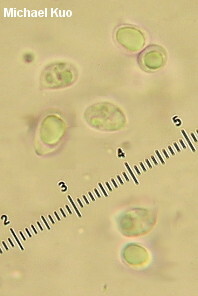 Microscopic Features: Spores 5-8 x 3.5-5 µ; smooth; ellipsoid; not constricted; hyaline in KOH; inamyloid. Basidia 50-60 µ long; 4-sterigmate. Hymenial cystidia absent. Lamellar trama parallel. Pileipellis an ixotrichoderm; brownish in KOH. REFERENCES: (Persoon, 1801) A. M. Ainsworth & P. M. Kirk, 2013. (Fries, 1821; Saccardo, 1887; Hesler and Smith, 1963; Phillips, 1991/2005; Roody, 2003; McNeil, 2006; Lodge et al., 2013.) Herb. Kuo 06161401.